Growing up in Ontario Canada, Justin Marra like most Canadian youngsters developed into a die-hard Toronto Maple Leaf fan. Unlike most youngsters in Canada who dream of making the game saving save in the Stanley Cup finals, Marra had other dreams. He hoped to become the next Pudge Rodriguez or Darren Fletcher, dreaming that he one day would be catching the game winning strike out in the world series. Height: 5′ 10″, Weight: 190 lb. Growing up in Ontario Canada, Justin Marra like most Canadian youngsters developed into a die-hard Toronto Maple Leaf fan. Unlike most youngsters in Canada who dream of making the game saving save in the Stanley Cup finals, Marra had other dreams. He hoped to become the next Pudge Rodriguez or Darren Fletcher, dreaming that he one day would be catching the game winning strike out in the world series. Marra’s dreams came one step closer to reality in 2011 when the Chicago Cubs drafted the backstop from Micheal Power High School in the 15th round. Marra has played and traveled to play baseball since he was a young age. His little league team fell just one game shy of a trip to Williamsport Pa. for the Little League World Series. That did not deter Marra. He continued to play and advance up the levels of baseball and took advantage of every opportunity he could to get more action on the field. Eventually he wound up with the Ontario Blue Jays. With the Blue Jays, Marra continued to develop his catching skills under the tutiledge of Damon Topolie and Jamie Pogue. The backstop also was able to obtain more valuable experience when he got the opportunity to play with the Canadian Junior National Team. Playing for programs such as the Ontario Blue Jays and Team Canada gave Marra a wealth of experience as he marched down the road toward a professional career. Not only did they provide room for him to learn and grow as a player but it prepared him for the rigors of the road as they traveled all over North America and even to the Dominican Republic. As the summer of 2011 approached, Marra had his sights set on the 2011 MLB draft and the hopes that he would be able to show scouts enough to get selected and start his professional career. While he had some College options if things did not go right for him during the draft, Marra was eager to get his professional career started. 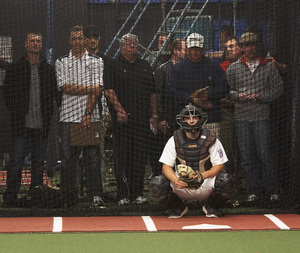 Leading up to the draft, the catcher attended some showcases for major league scouts including some private workouts for the Milwaukee Brewers and his hometown Toronto Blue Jays. Marra had developed a solid hitting tool but scouts came away impressed with his throwing abilities and his disciplined approach behind the plate. It was neither the Blue Jays or Brewers who selected Marra in the 2011 draft. That honor went to the Chicago Cubs when they selected the backstop in the 15th round. Marra was eager get integrated into the Cubs system and after signing reported to the Cubs facilities in Arizona to begin instructionals. After spending the remainder of the 2011 season and a portion of the 2012 season there, Marra was finally poised to play in his first professional games. He made his debut for the Arizona Rookie League Cubs when the season got under way in June. All Marra did was hit when he got into action. In 90 at bats, the backstop hit .322 and showed some extra base hit power hitting 12 of his 29 hits for extra bases. Marra also showed a keen eye for the strike zone, walking 21 times while only striking out 19. The Cubs rewarded Marra for his strong rookie league campaign by promoting him up to Boise, their short season class A affiliate for the end of the season drive to the playoffs. Marra played in two games and went three for five (.600 avg). Unfortunately the Hawks did not make the playoffs and Marra’s 2012 season came to an end. 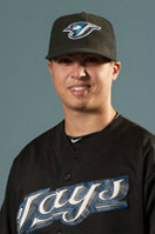 In 2013 look for Marra to start his season with the Boise Hawks. Marra is young and his road to the major leagues is still long but one day Marra hopes to be putting on the catcher’s mask and running out onto Wrigley Field in Chicago as the Cubs starting catcher. We will continue to follow Justin’s progress all season long in Boise or wherever he may land once the Cubs assign him to one of their affiliates. Be sure to follow Justin on twitter @JustinMarra and follow us at @CTD_Sypien as we will provide updates on Justin all season long. 1. What was it like to be drafted? What were you doing when you found out? Getting drafted was a dream come true. Getting to play the game I love for a living is truly a dream come true. I knew the draft was that day, so I stayed home from school and I was with my family, watching the computer and talking. 2. Growing up in Ontario, a traditional Hockey hotbed, Is it harder to get noticed / discovered by baseball scouts? It is definitely more difficult to get noticed in Canada, but programs such as the Ontario Blue Jays, as well as the Canadian Junior National team make it a lot easier to get noticed and give you that kind of exposure it takes to be recognized. 3. Before your professional career got started you had a chance to be apart of the Canadian Jr. National Team. What was that experience like for you? Being part of the Canadian Junior National team was an honor. It is truly something special to be apart of that community and get to represent your country. Being able to travel the world and play for your country is an experience that I will never forget. 4. Did you have any idea that the Cubs were interested in you prior to your selection in the draft? Who was the scout from the Cubs who was most responsible for convincing the Cubs to select you? I had a slight idea that the Cubs were interested in selecting me but it wasn’t until earlier that day I received a call from Matt Sherman, I realized the Cubs were among the more interested teams. I believe Matt was most responsible for the Cubs taking me. 5. Catching is a demanding position. Is there a particular instructor or coach in the Cubs organization that has really aided in your development to this point in your career? Not particularly, all the coaches and catching instructors have helped a lot, it’s a lot of taking what they tell you and teach you and applying it into your work and practice everyday. Our new catching instructor and field coordinator Tim Cossins has been a tremendous help in my defense. 6. Is there a particular moment that stands out as your biggest highlight of your professional career so far? I would have to say the moment that stands out would have to be going to Boise (short season A) and being a part of that playoff run, unfortunately we came up just short losing in the last game, but it was an incredible baseball atmosphere as well as an incredible experience, and I hope to experience it in the years to come. 7. What goals do you have for 2013? Not any real specific goals, just play hard everyday and let things fall into place. As far as where I’ll be this season, I’m not sure what is going to happen, I’m just going to control the things I can control and play my best wherever I am. 1. Favorite baseball player growing up? Growing up I idolized a lot of baseball players but I always remember watching Darren Fletcher with the Blue Jays. 2. I noticed you enjoy gaming, what is your console of choice and what are your top games you enjoy playing? When I have some free time, sometimes I play X-Box. I like sport games, mostly NHL but I also play some shooting games such as Halo or Call Of Duty. 3. Which two teams will play for the rights to hoist Lord Stanley and who will win it all? I would love to see the Leafs play for the cup, but that might be me speaking with my heart. Regardless I’m going to say Leafs and Ducks. The cup comes back home to Canada! Unfortunately for Justin, the Maple Leafs and Ducks were both eliminated in-game seven of the first round of the 2013 playoffs. This year was the first year the Maple Leafs have made the playoffs in many so hopefully its a sign of good things to come for Justin’s team. A special thanks to Justin for taking some time out of his schedule to answer some questions for us. We look forward to following him all season long and into the future. Please give Justin a follow on twitter @JustinMarra and like us on Facebook and follow us on twitter @CTD_Sypien as we continue to feature and follow all of our featured players as they chase their way to the major leagues. You certainly do an enviable number of interviews here, more of which I wish I had the time to do. As it is, I am but a lowly blogger -_- Keep ’em coming! Thanks! Appreciate you reading our stories!